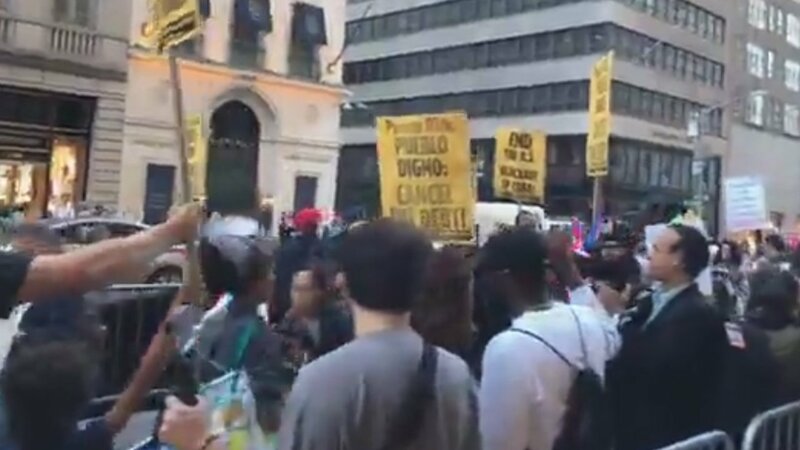 NEW YORK (WABC) -- More than a hundred demonstrators filled part of Fifth Avenue near Trump Tower Tuesday evening, rallying support for Puerto Rico in the wake of Hurricane Maria. Many of the protesters said they were offended by President Trump's remarks earlier in the day in San Juan, where he had flown for a visit amid mounting criticism of the slow pace of federal-led recovery efforts. President Trump told officials at the Muniz Air National Guard base that they should be "proud" that only 16 people died as a result of Hurricane Maria, compared to the scores killed "in a real catastrophe" like Hurricane Katrina. Shortly after his comments, the death toll on Puerto Rico was revised to 34. Later, Trump appeared at a church outside San Juan, where he handed out packages of rice and lobbed paper towel rolls into the crowd.